1370 Washington Ave, Ste 302. International Version (Not compatible with Samsung Pay). All our phones are brand new unless specified otherwise. Our phones are factory unlocked and come with all original accessories in original box. Our phones might come with International Charger. A free US adapter will be added to your order for free if needed. GSM / CDMA / HSPA / EVDO / LTE. GSM 850 / 900 / 1800 / 1900 - SIM 1 & SIM 2. HSDPA 850 / 900 / 1700(AWS) / 1900 / 2100 - Global, USA. LTE band 1(2100), 2(1900), 3(1800), 4(1700/2100), 5(850), 7(2600), 8(900), 12(700), 13(700), 17(700), 18(800), 19(800), 20(800), 25(1900), 26(850), 28(700), 32(1500), 38(2600), 39(1900), 40(2300), 41(2500), 66(1700/2100) - Global. HSPA 42.2/5.76 Mbps, LTE-A (6CA) Cat18 1200/200 Mbps. 158.1 x 73.8 x 8.5 mm (6.22 x 2.91 x 0.33 in). 189 g (6.67 oz). Front/back glass (Gorilla Glass 5), aluminum frame. Single SIM (Nano-SIM) or Hybrid Dual SIM (Nano-SIM, dual stand-by). Super AMOLED capacitive touchscreen, 16M colors. 6.2 inches, 98.3 cm. 1440 x 2960 pixels, 18.5:9 ratio (529 ppi density). HDR10 compliant - 3D Touch (home button only) - Always-on display. Exynos 9810 Octa - EMEA Qualcomm SDM845 Snapdragon 845 - USA/LATAM, China. Octa-core (4x2.7 GHz Mongoose M3 & 4x1.8 GHz Cortex-A55) - EMEA Octa-core (4x2.8 GHz Kryo 385 Gold & 4x1.7 GHz Kryo 385 Silver) - USA/LATAM, China. Mali-G72 MP18 - EMEA Adreno 630 - USA/LATAM, China. MicroSD, up to 512 GB (uses SIM 2 slot) - dual SIM model only. 12 MP, f/1.5-2.4, 26mm, 1/2.55", 1.4m, Dual Pixel PDAF, OIS 12 MP, f/2.4, 52mm, 1/3.6", 1m, AF, OIS, 2x optical zoom. 8 MP, f/1.7, 25mm, 1/3.6, 1.22m, AF. 32-bit/384kHz audio - Active noise cancellation with dedicated mic. Wi-Fi 802.11 a/b/g/n/ac, dual-band, Wi-Fi Direct, hotspot. 5.0, A2DP, LE, aptX. Yes, with A-GPS, GLONASS, BDS, GALILEO. FM radio (USA & Canada only). 3.1, Type-C 1.0 reversible connector. Iris scanner, fingerprint (rear-mounted), accelerometer, gyro, proximity, compass, barometer, heart rate, SpO2. Samsung DeX (desktop experience support) - Fast battery charging (Quick Charge 2.0) - Qi/PMA wireless charging (market dependent) - ANT+ support - Bixby natural language commands and dictation - MP4/DivX/XviD/H. 265 player - MP3/WAV/eAAC+/FLAC player - Photo/video editor - Document editor. Non-removable Li-Ion 3500 mAh battery (13.48 Wh). Midnight Black, Coral Blue, Titanium Gray, Lilac Purple, Burgundy Red, Sunrise Gold. Basemark OS II: 3297 / Basemark OS II 2.0: 3354 Basemark X: 42134. Contrast ratio: Infinite (nominal), 4.537 (sunlight). Voice 68dB / Noise 74dB / Ring 80dB. Noise -92.6dB / Crosstalk -93.4dB. Successful photos during the day and evening. The camera that's brilliant in the dark. The F1.5 aperture mode finds light even in the dark. So the low light camera delivers vibrant photos late into the night. Meaning your camera no longer has a curfew. Super Slow-mo lets you see the things you could have missed in the blink of an eye. Set the video to music or turn it into a looping GIF, and share it with a tap. Then sit back and watch the reactions roll in. Liven up your chats using AR Emoji stickers and videos. Apps that do not support animated GIFs may still send AR Emoji stickers as a still image. The camera that recognizes you instantly. Image simulated for illustrative purposes. Accuracy of Intelligent Scan may differ depending on surrounding conditions. We make the things that bring family together. When Samsung devices connect to each other, you can enjoy more control, seamless entertainment, streamlined shopping and connected moments with your loved ones. We "Guarantee" that we will make our best efforts to make you 100% satisfied! Sobeonline1 makes every effort to get your order out as soon as possible. Below is a link that explains how to confirm it. International Buyers - Please Note. Replacement We will send a product replacement after the authorized return has completed our receiving/inspection process. Please allow additional processing time after Holidays. Battery, charger, cords, straps, etc. The RA number or any other inscriptions must not be written or printed on the product box or packaging. We will not process the return if any of these conditions are not followed. All our phones are brand new unless specified. Our phones come with all original accessories in original box. Our phones are international and might come with International (American or European) Charger. (Our phones do not work with CDMA carriers like Verizon, Sprint, Boost, or any other CDMA Network Carrier). We do not guarantee, imply or express warranties unless otherwise stated in the listing. Address cannot be changed at any time. Other: We have the right to cancel the order under the following circumstances. In case of a Pricing Error. This policy may be modified or changed without any further notice. 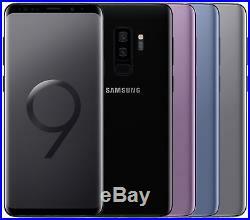 Samsung Galaxy S9 SM-G960F/DS 64GB DUAL SIM (Factory Unlocked) Pick Your Color. 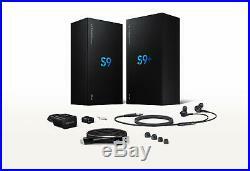 Samsung Galaxy S9+ Plus SM-G965F/DS Dual Sim (FACTORY UNLOCKED) 6.2 64GB 6GB RAM. SOBEONLINE1 1370 Washington Ave Ste 302 Miami Beach FL 33139. The item "Samsung Galaxy S9+ Plus SM-G965F/DS Dual Sim (FACTORY UNLOCKED) 6.2 64GB 6GB RAM" is in sale since Wednesday, February 14, 2018.